In this lesson we’ll check out some string-skipping ideas you can loop, as in continuously repeat. This is a techique I love to use in my music, and it is very good for your chops. Because the notation doesn’t always include repeat signs, you’ll have to use your imagination with some of these phrases. Ex. 2 is based on the D Phrygian Dominant scale (D, Eb, F#, G, A, Bb, C). 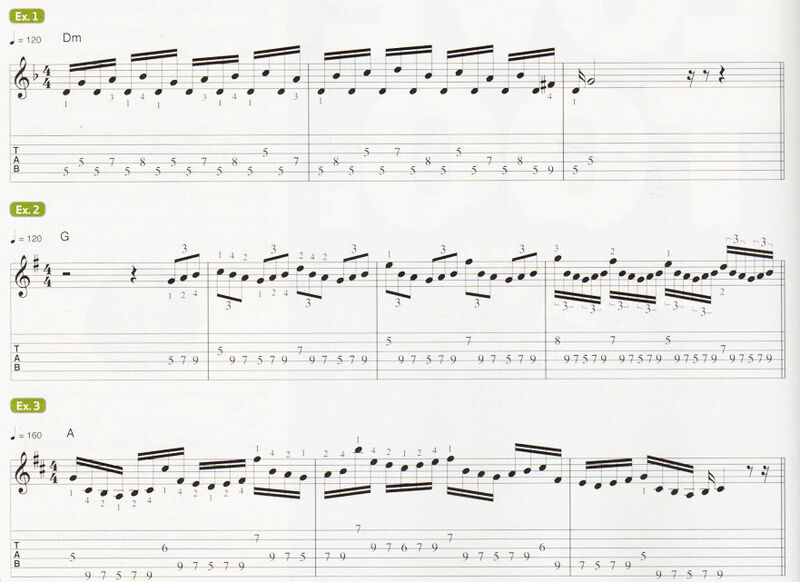 The concept behind this phrase is that the D pedal tone is played after each note. The phrase is based off an ascending four-note scale sequence and then a descending pattern in third intervals. This is a technique used in different types of music, especially classical. Be sure to start slow and then build up speed. This next example, Ex. 2, is in the key of G major (G, A, B, C, D, E, F#). 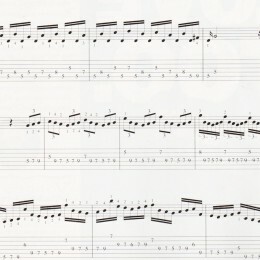 This is a string-skipping pattern that starts off with eighth-note triplets and then, in the 3rd bar, the same phrase is played with sixteenth-note triplets. The tempo is the same throughout, we’re just changing the note value. This is great for developing your right-hand technique and to add some excitement to your playing. Ex. 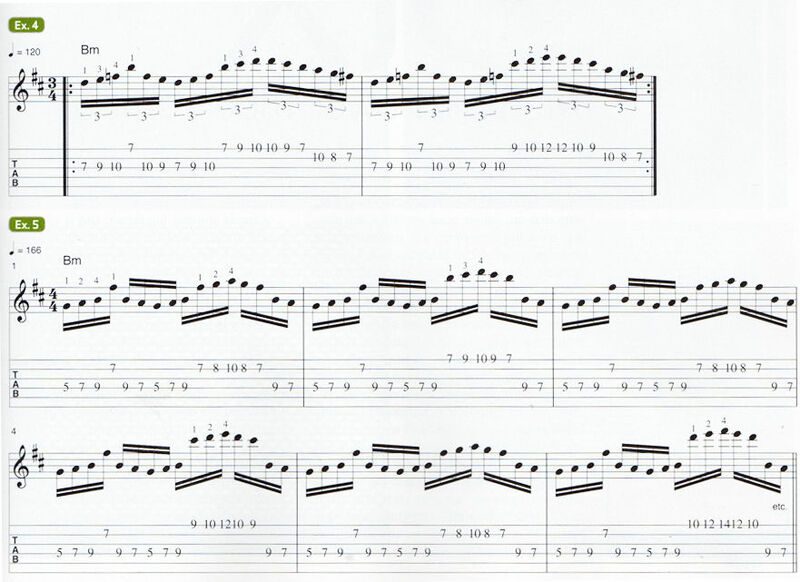 3 is another string skipping pattern, this time in the A Mixolydian mode (A, B, C#, D, E, F#, G). You will notice the same pattern repeats through the scale with a six-note pattern. The notation is written using straight sixteenth-notes, but also try converting this phrase into sixteenth-note triplets. I begin this pattern with an upstroke, so the right-hand alternate picking pattern will be up, down, up down, etc. You can experiment with the right hand picking that is comfortable to you. The next couple of phrases in Ex. 4 sound real cool looped. In this example, we have a string skipping line that uses the B minor scale (B, C#, D, E, F#, G, A) with an added b5 interval, which would be a F note. You could think of this as a B minor scale mixed with a B blues scale.